CVT Drive Belts. Specifically designed for a variety of motorized CVT applications including street-legal scooters and go-karts. Standard belt has OEM-equivalent or better performance. 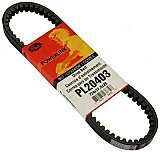 The Continuously Variable Transmission (CVT) belt is an integral part of your automatic Scooter’s, Go Kart, or ATV’s transmission. Extreme Motor Sales has more CVT belt sizes available than anyone else, and we are adding more all of the time! Scooter CVT belts are available from multiple companies, and in varying compositions. We currently provide high quality CVT belts from Gates and Bando, as well as our own Universal brand. The premium Gates and Bando are Aramid (the generic name of a certain bulletproof fabric) reinforced for high strength and long life.